What is the most controversial aspect about the Rapture? Nathan Jones: Since we are talking about end time events, let's talk about one of the most controversial end time events — the Rapture of the Church. Could you tell us a little about the meaning of the Rapture and why it is controversial? Dr. Hutchings: The Rapture as referred to by you and me of course marks the end of the Church Age dispensation. The Rapture is when the dead in Christ shall rise along with we who are left alive, and will go up to meet the Lord. Jesus finally comes for His Church. The most controversy comes from the several views concerning the timing of the Rapture, and I'm sure some of them are more controversial than others. You can get into a discussion with those who believe in a Post-Trib Rapture, in that the Rapture happens at the end of the coming 7-year Tribulation, and you can get into some rather interesting dialogue with them. Others would say the Rapture is going to happen before the Tribulation. Some will say it will happen in the middle of the Tribulation. Others also say that at the end of the Tribulation the Rapture and the Second Coming will just be one and the same. I hold to what's called the Pre-Tribulational or for short Pre-Trib Rapture view. I hold to the Pre-Trib position that teaches that when the Church Age has come to an end the Rapture will occur, the Church will be translated to Heaven. Paul wrote to the Christians in Thessalonica who were under great persecution, and he told them their final hope would be the Rapture of the Church. The dead in Christ will rise first, and those believers left alive will also rise to meet the Lord in the air, and so shall we ever be with the Lord forever. If the Church was going through the Tribulation as some believe, which would be the Post-Trib position, then why would Paul try to give them comfort by referring to the coming of Christ, because they would still have to go through the Tribulation. I know there's a lot of different opinions, but I believe that the Church Age will end, the Christian era will end, and all before the Tribulation actually begins. Dr. Reagan: As you well know, the Bible does not say specifically when the Rapture will occur. That's why there is so much difference of opinion. People can honestly disagree about the timing. But, I agree with you. I think that the best inference of the Bible is that the Rapture will occur before the Tribulation begins. Dr. Reagan: What would you say from your viewpoint is the most powerful argument in behalf of a Pre-Tribulation Rapture? Dr. Hutchings: Look at the book of Revelation, for example. The first three chapters concern the Church. I think it is a prophetic history of the Church Age. Then you go into Revelation 4, which is the beginning of the Tribulation period. You go through chapter 19 when the Tribulation period finally ends. Between chapters 4 and chapters 19 the Church is not mentioned one time. Remarkably, the Christian is not mentioned even one time. Dr. Reagan: There believers during the Tribulation are referenced to as Saints. Dr. Hutchings: Yes, they are references to as Saints, but of course, we're all saints. We are all set apart in Christ when we have put our faith and trust in Him. There will be people saved during the Tribulation, but most will be killed for refusing to take the Mark of the Beast and worship his image. That is not a commandment for today. So, the Church is not mentioned in the Tribulation setting, but we see the Church mentioned in Revelation again after the Tribulation. During the Tribulation, we read in Revelation about the 144,000 Jews who will be saved and set apart. There will be saints in the Tribulation, meaning there will be some saved, but that is simply all that it means. You're a saint because you have been sanctified and set apart, but these Tribulation Saints are not part of the Church. Dr. Reagan: I've always felt like that one of the major arguments in behalf of a Pre-Tribulational Rapture is imminence. The Bible says that Jesus can come at any moment. Any moment! But, if you don't believe in a Pre-Tribulational Rapture, Jesus cannot come at any moment because there are a whole lot of things that have to happen first, such as there has to be a temple built in Israel. There has to be the Antichrist. There has to be the entire seven years of Tribulation. The only way that Jesus can come at any moment is for you to believe in a Rapture before the Tribulation. Dr. Hutchings: That is absolutely true. If you study the Pauline Epistles and the messages to the churches, I can't find anywhere in there where Christians are admonished that they have to be careful about not worshipping the Antichrist by taking the Mark of the Beast, or even about a Tribulation period. Dr. Reagan: We never are we told to look for the Antichrist. We are told to look for Jesus Christ. Nathan Jones: A Pre-Trib Rapture just makes sense. When we are talking about the Bride of Christ — the Church — we know without a shadow of a doubt that Jesus loves His Bride. Jesus is to "marry" the Bride spiritually. I heard fellow Bible prophecy teacher Don McGee say this recently, and I thought this was great what he says. Jesus has got most of the Bride with Him right now in Heaven, but part of the Bride, that's us, are still on earth. You don't beat up part of your wife for seven years under your very own judgments and expect afterwards she's going to say, "Yeah, I'm going to marry you." It just doesn't happen. God wants all of His Bride to be with Him up in Heaven and protected from His wrath. Dr. Reagan: That raises a good point, because there exists with some people this odd idea that the Church has to go through the Tribulation to be "purified." Nathan Jones: Jesus' blood already purifies us from our sins. Dr. Reagan: True, and since we're already purified by the blood of Christ, the Church certainly doesn't need the Tribulation. Dr. Hutchings: There is no reason for the Church to go through the Tribulation. Why should we go through the Tribulation? Nathan Jones: I hear people all the time say that the Church needs to be there because otherwise the people during that time won't hear the Gospel. But, there's many ways that people will hear the Gospel during the Tribulation, right? Dr. Reagan: There's going to be Bibles left lying around all over the place. Plus, we've got the Two Witnesses of Revelation 11 who in Jerusalem will be proclaiming the Gospel. Nathan Jones: Then there's the Gospel Angel of Revelation 14:6 who actually goes to everybody alive in the Tribulation and shares the Gospel so that no person by the end of the Tribulation is without excuse. Dr. Hutchings: Israel as a nation we do know will go through the Tribulation. I've been to Israel many, many times. In Israel today, less than one-third of 1% believe that Jesus Christ is the Messiah. They still are rejecting Him. The children are asked in Israeli schools, "Would the Messiah have destroyed the Temple? Would the Messiah have collaborated with the Romans to destroy Jerusalem?" They reply, "Of course not. So, Jesus is not the Messiah." Israelis are still looking for the Messiah to come. Dr. Reagan: You know as well as I do, and as many times as you have been to Israel, there are thousands of guides there who have their heads full of Scripture. They have to in order to be qualified as guides. One day something is going to happen that is going to move that knowledge from their head to their hearts, and that is the Second Coming of Jesus Christ at the end of the Tribulation. 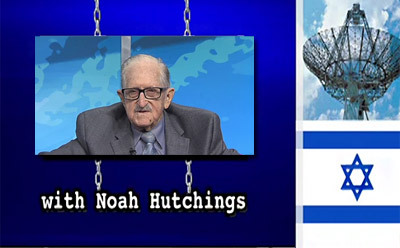 In the second part of this interview with Dr. Noah Hutchings on end time events, he'll explain what the Tribulation is all about. To be fair to the Post-trib, position I hope you will allow these comments, answering the two "powerful" arguments. #1 The tribulation saints who put their faith and trust in Christ... when 2 or more of them join together on earth, what is that called? The church. Since the Bible refers to them as a multitude which no man can number, it is fair to say that 2 or more of them will gather with Christ in the midst of them. #2 Paul says the day will NOT overtake believers as a thief, not because the day comes without signs, but because believers will be watching and will recognize the signs that MUST precede ‘that day’ (1Thes 5:4-6; 2Thes 2:3-4; Mt 24:15; Dan 11:21-45). The thief like return of Jesus is presented as yet future (Rev 16:15), after the sixth bowl (Rev 16:12). An examination of the context of Rev 16:12-17 will show that the warning of Jesus’ thief- like coming is significantly placed between the sixth and seventh bowels, and the context makes clear that the seventh bowl is “Armageddon, the battle of the great day of God Almighty” (Rev 16:14-17). This points to the fact that Jesus’ coming to destroy the Antichrist (2Thes 2:8) is the same coming that is elsewhere compared to the coming of a thief. Sorry, I was signed in under my wife's account for the above comment. excuse me did you delete my comment? here is the answer to the debate. Chuck, who opens the seven seals from the very first Seal Judgment? Jesus, right. Where do the angels receive the seven Trumpet Judgments? Before the throne of God. Where do the seven Bowl Judgments come forth from? The heavenly Temple where God dwells. In each case, every one of the 21 Tribulation judgements come from God Himself, and therefore all of the Tribulation is God's wrath, not just the last 3.5 years. Lonecar144, the Rapture is only for the 144,000?!? The 144,000 will be Jews who have entered the Tribulation not believing but will at the beginning of that time accept Jesus as Savior and be witnesses for Him. They will lead a remnant of Jews to believe in Jesus as their Messiah who will live through the Tribulation time ahead (Isa. 10:20-22; Jer. 4:27; Ezek 11:19-20;…) to come into the fulfillment of land, throne, and kingship that are given throughout the Bible. Jews have only one way of salvation like Gentiles, but they have been given by God so many more promises that God has yet to fulfill (2 Sam. 7:10; Isa. 60:1-7; Joel 2:26-27;…). The gathering of the elect Tribulation Saints (Mat. 24:31) will certainly include the 144,000, but it will also include every believer who survived the Tribulation, for we know that during the Millennial Kingdom there will be nations other than Israel (Zech. 14:16-19). For more on the 144,000, check out this article. Love the article and the great words of encouragment for the PRE Tribulation return of our Lord. If it's not PRE Trib, then someone, anyone, explain how I can be encouraged if I have to go through the most terrible events to ever occur in all of eternity? "...we who are still alive and are left will be caught up together with them in the clouds to meet the Lord in the air. And so we will be with the Lord forever. Therefore encourage one another with these words." "...we (WHO HAVE SUFFERED THE WRATH OF GOD WITH THE EVIL UNBELIEVERS) who are (LUCKILY) still alive and are left will be caught up together with them in the clouds to meet the Lord in the air. And so we will be with the Lord forever. Therefore (SEE IF YOU CAN NOW) encourage one another with these words." "For God did not appoint us to suffer wrath but to receive salvation through our Lord Jesus Christ. He died for us so that, whether we are awake or asleep, we may live together with him. Therefore encourage one another and build each other up, just as in fact you are doing." "For God did not appoint us to suffer wrath (EXCEPT THOSE BELIEVERS UNLUCKY ENOUGH TO BE ALIVE IN THE END TIMES) but to receive salvation through our Lord Jesus Christ. He died for us so that, whether we are awake or asleep, we may live together with him. Therefore encourage one another and build each other up, just as in fact you are doing (IN THE MEANTIME TRY TO HANG IN THERE AS THE ANTI-CHRIST RULES, NUCLEAR WAR RAGES, AND THE WRATH OF GOD POURS OUT UPON YOU VIA HIS JUDGEMENTS FOR 7 YEARS." In the end time/tribulation power is given to the beast/antichrist to make war and overcome the saints...are these Christians or Jews and are these saints the ones saved during trib? Confusing since saints are to be raptured right? Zec_14:5 And ye shall flee to the valley of the mountains; for the valley of the mountains shall reach unto Azal: yea, ye shall flee, like as ye fled from before the earthquake in the days of Uzziah king of Judah: and the LORD my God shall come, and all the saints with thee. Pre trib is like "imminent rapture," which we have heard preached for over 20 years? The church fell away probably 50 years ago when they went liberal! The only church left is the true believers. Just read what Jesus said in Matt 24:15 and Paul says in 2 Thess 2:3, "There must be a falling away first and the man of sin sitting in the temple." Can anyone see him there? have a massive number of believers fallen away? Where are the mockers saying that Jesus will not return? I would suggest these come after WW III is over, peace accord with Israel signed, no rapture? then the mocking. Lord help all the preachers when some fall away because of their preaching (Eze 3 & 33). Jesus tells us in John 6, 4 times when the rapture is (6:39,40,44,54). Even Martha, a peasant girl knew when the rapture would be? But true believers in China, Africa and the Middle East must suffer persecution and death and no rapture? But these 'righteous' Americans must be raptured before any tribulation? In the mean time you have a Muslem, gay president causing strife and division around the world and is bent on destroying Israel and the US, and let us not mention the 55 million abortions? something is not right in the realms of the US Christian movement. Forget about the big US "self" and for once ask the Lord when the rapture will be and how should I serve you Lord daily. Humble yourselves for once as we in Africa have learnt. God bless. I started studying about the Rapture 5 or 6 years ago. one of the things that helped me was when I read that the trumpet will be blown and we shall be taken up. 1st Thes. 4;16 and 17. But when Jesus comes back, his foot touches mount Olive. And his feet shall stand in that day upon the mount of Olives, which [is] before Jerusalem on the east, and the mount of Olives shall cleave in the midst thereof toward the east and toward the west, etc. To me that proves that he returns 2 times.. but the first time he in in the sky. Lonecar144, comments that just posting to advertise one's own website are of course deleted. Jeri, the saints during the Tribulation are not the Church, and have been dubbed Tribulation Saints to mark the difference. The Church will have been raptured before the Tribulation begins. Anonymous, the EU loses more than Israel does by banning trade with what they believe are occupied territories. Those who attempt to hurt Israel always end up hurting themselves. Marie, nobody during the Tribulation will be tricked into taking the Mark of the Beast. It is a declaration of loyalty to the Antichrist and his master Satan. This will not occur until the mid-point of the Tribulation, so there's no need for the Church to worry about accidently taking it, as we'll be raptured out before the Tribulation begins. my blogs are all scripture based; i have had these debates before to copy and paste would be redundant and space consuming. Enjoyed Rolly's comments, and Marie asks a good question. "Saints" is not a word used exclusively in just certain chapters of Revelation, so if these "believers" are not the church, why wasn't a totally different word used? Because, they are not different, they are part of the church, and the only people who call them tribulation saints, are people who are trying to defend their view. The church could experience protection like the children of Israel during the Egyptian plagues. The church could and should be a light during dark times. The church could and should expect to endure persecution just like their Lord did. Thanks again for allowing these thoughts. Being a Christian does mean having to endure suffering and trials at the hand of man (Jn. 16:33; Phil. 1:27; 1 Thes. 3:3; 1 Pet. 4:12-13), the Tribulation like the Flood is about God's wrath (Isa. 24:22; Zeph. 3:8; 1 Thes. 5:3; 2 Thes. 2:12), and believers in Christ are promised to be exempt from God’s wrath (1 Thes. 1:10; 5:9; Rom. 5:9; Eph. 5:6; Col. 3:4; Rev. 3:10). There’s an important difference there. Chuck, if believers are to be protected during the Tribulation, then what is your take on the "great multitude that no one could count, from every nation, tribe, people and language" (Rev. 7:9) that "come out of the great tribulation" (Rev. 7:14) who were killed during the 5th Seal (Rev. 6:9-11) which Jesus opens (Rev. 5:5)? Doesn't read like much protection's going on for these "great tribulation" (Rev. 7:14) believers. There's a lot more that can be said; but if the church is offered protection then why does God have to cut those days short otherwise no flesh would be saved (Matt 24:22)? And why are there so many trib martyrs at Rev 7? The thief in the night comment at Rev 16 is simply a narrative pause where those who are reading Revelation are warned of the future consequences. By the time of those events everyone knows what's occurring. That there are trib saints does not mean the church can't have been raptured. In fact the word saints is also used for Israel in Psalm 149. Without any Doubt, There Has to Be at two instances, of the Church being taken of the earth or. One Before the Tribulation and One at the End of the Tribulation. I personally don’t know about any others but these two I do know, Absolutely, 100%, Have to Be. I assume we all know that JESUS comes at the end of the Tribulation as in, Matthew 24:27 which says "For as the lightning comes from the east and flashes to the west, so also will the coming of the Son of Man be”. And HE goes on through verse 35 describing what will happen and the gathering together of his Elect in the clouds and the returning to Earth at the end of the Tribulation. But then in verse 36 HE says "But of that day and hour no one knows, not even the angels of heaven, but my Father only”. And in verse 43 HE says “Therefore keep watch, because you do not know on what day your Lord will come”. In fact verse 36 through the rest of the chapter is about JESUS coming back in secret before the Tribulation begins. Because if I’m on the earth the day the seven-year covenant with Israel is signed, which to my knowledge starts the Tribulation, I will know the exact Day and Hour that JESUS will return. The Bible says he will come back seven years after the covenant is signed. So my Lord JESUS, from verse 36 on, has to be talking to people who will not be here when the covenant is signed. The First taking away or Rapture has to happen before the covenant is signed or the Bible is wrong and I know that’s Impossible. The Elect that are caught up to JESUS in verse 31 have come to know HIM after the First Rapture has occurred and the seven-year covenant is signed. Thank your for your simple explanation of the Pretribulation Rapture. I started studying the End Times/Rapture/prophesies in June, 1967 when Israel won the 6-Day War. We were traveling up the East Coast from Georgia to Pennsylvania. From my personal studies, from Bible Study Groups and from pastors I have had, I believe in the Pretrib Rapture for the very reasons you have presented. Thank you. Thanks silversword Hope to be seeing you soon. There is already ONE Church ready for the false prophet to take over. ONE Government ready to complete next for the Antichrist to come. ONE World on the fast track. Well said, Liz and everyone else who is pre-trib. Maranatha! LAST TRUMP being after 7 seals and six trumps. I think the trumpet heard at the Rapture the Bible is referring to the last of the Feast of Trumpets during the Church Age, the feast God has most likely appointed to express the Rapture. Speaking of fiction, why read a rapture into the 7th trumpet when it isn't there and when the context is wrath? Honestly, the wrath of God is eternal, like God is. Romans 5:9 and Eph. 5:6 are talking about eternal punishment and separation. The Judgments of God are being poured out in Revelation, but judgment is not something the believer is afraid of neither is death, so all those martyrs prove nothing. Do you think any of them regret dying in God's service? Of course you don't. Death is not the end. The willingness of the church to lay down their lives for the Jews and those around them who do not know the Lord is the kind of witness that Christians gave to Jews during the Nazi time. The willingness lay down your life is the highest form of love. Lastly for "amc" Matthew 24:22 only proves that it is by grace that we are saved. God knows how much we could take, I am OK with that. I don't see how anyone can read Matthew 24 straight through and then say that the rapture comes before the tribulation. I don't see how anyone can read 1 and @ Thes. and not see that Paul was preparing the church to walk through the tribulation and to take note of the signs. and again just for 'amc' , "saints" is an easy word search and is used for the believers who make up the church over and over in the NT. Peace. Seeing that I've been addressed, I'll respond as briefly as I can. Citing Matt 24:22 is germane to those above who say the length of the GT has been shortened by the rapture. Quite aside from the issue of grace and the willingness to suffer, it proves that the context of the shortening is to preserve flesh, which in the event of the rapture would be redundant. The fact that God needs to curtail that period shows that there is no preservation within it as some argue (Rev 3:10). Note also that most premil rapture views agree that the church does not experience God's wrath, hence much debate rests on where that eschatological wrath occurs. Edmond Hiebert (I & 2 Thessalonians) does a decent job addressing the issue of exemption of God's eschatological wrath and the fact that Paul actually didn't warn the church about the tribulation - as does Mayhue and several others. Whatever one's rapture view - and especially if you're prewrath or later-in-the week posttrib - one still has to deal with people coming to faith after the rapture and, consequently, during God's wrath, otherwise no believers will enter the millennium in their physical bodies. That's whether you're a dispie or not. What do you call those saints? Not sure of your intended meaning re saints being an easy word. Deut 30:1-5, 2 Sam 7:23-24, Isaiah 27:13 & 11:10-12, Hos 5:15, Matt 23:39 & Matt 24:32 and Rom 11:26-28 tell us the story that Israel as a nation is still elect and that God will redeem them. Moreover they affirm that Christ's coming is contingent on their asking Him. That being the case we have the difficulty arising that if Christ's single coming at the end of the week is contingent upon Israel's national repentance then shouldn't Israel also be raptured. Note: That should have read Matt 24:31 (not 32) - Israel's promised gathering. If you study the Bible and get to know the God of the Bible which we serve, you will know God's character throughout the Bible. He will never, ever, punish the just with the unjust. When He destroyed Sodom & Gomorrah, He got Lot out along with his family. When the angel of death was going through Egypt, those who had blood on their door post got spared. God even placed the Hebrews in the land of Gos-hen where none of the plagues even touched them. God calls the Tribulation, Jacob's Trouble not the church's trouble. We will be spared from the Tribulation because we are not under God's judgement, we are justified by the blood of Jesus. God is not an unjust God, will never punish His children along with the wicked, impossible!!! "amc" thank you for keeping the debate going, I will respond later when I have more time. "Anonymous" The persecuted church in many lands is a daily example of the unjust punishing the just, but they would say, to die a martyr's death is not "bad." Dying in this life is not punishment or God's wrath when you are in the Lord's service. Dying in this life in that way is ultimately LIFE! When I read Rev. 3:10 I see the "keeping" that God promises as the giving of His grace in the hour of temptation and trial. So He keeps us in and through the trial, not out of it. The same 'strong's word'#5083 is used in John 17:11-15 by the same author, John, as in Revelation, and the understanding is to be kept in the midst of something not taken out of it. Would you agree? And that prayer was answered in spite of the fact that 11 of the 12 disciples died a martyr's death, because that kind of a death is an honor not a curse. As I have said before the wrath of God to me is His eternal punishment, this is what Christ saves us from. My view does not "need" believers in their physical bodies coming into the 1,000 year reign. The church is raptured and reigns with Him in glorified bodies. The Jews who get saved at the moment of seeing Jesus, are on the earth to fulfill the many covenant promises. And there are surviving peoples, and nations still on the earth that are referred to as coming to Jerusalem during the 1,000 year reign. Those gathered for battle die at Armageddon, but many not gathered there survive, and enter the thousand years in their physical body. One event at the end of the tribulation can be both judgment and rapture and salvation. I really do not have a problem with that either. The cross was both judgment and salvation, apostolic ministry is both judgment and salvation. I see you recommended a book for me to read, but since that book proclaims the exact opposite of what a simple reading of scripture states, I will not be reading that book. 2 Thes. 2 is Paul speaking directly to the church at Thesslonica, reminding them of what he had already taught them about signs and what to be aware of and watching for. The 'lawless one' must appear and the only coming of Jesus spoken of is when He comes to slay the lawless one - at the end of the tribulation. Again, thank you for taking the time to keep this debate going, and thank you for keeping it 'honoring' to the One that we serve. Zepaniah 2:3 Seek ye the LORD, all ye meek of the earth, which have wrought his judgment; seek righteousness, seek meekness: it may be ye shall be hid in the day of the LORD'S anger. Thanks Marie, of course the pre-trib argument will be, that is Jews who are hid, not the church, it has been removed. But if we truly understand the cross and its implications for us as the church (John 15:20). Endurance and perseverance are held up as ultimately good character traits by God. The desire to 'escape' is not. Whether the members of the end time, tribulation church are martyred or hidden, it will not matter to them, "Worthy is the Lamb that was slain." will be their cry. 3. Haven't read, read over, and/or ignore Exodus 33:19 and Romans 9:15 when they use the "other Christians have been persecuted and martyr & some will not?" argument. 4. Don't know the difference between man's persecution vs. God's wrath. My post-trib response to the above. 3) I am a firm believer in the sovereignty of the God who chooses, so I don't see where this fits in to the discussion. 4) We differ on this, and that is why we are debating. again 5) The pre-trib view does allow for escape, but that wording is kind of harsh, so I will withdraw it. But the Jews and the so called tribulation saints, are called to go through it... I just think God is calling the church to be their, I don't believe it is His wrath, but I do believe it is the tribulation, the great one. 6) Being worthy, comes from grace alone, we do not disagree there. 7) I have spent hours looking at and reading and considering other points of view. I do have a 'rule' that if someone takes 45 pages to explain why the 'plain and simple' meaning of a passage is not what it means...yes, I don't read any further. Just some post-trib, "food for thought for anyone who might drop by this web-site. When is a "day" in scripture, ever equal to seven years?? Please put Revelation 3:10 and John 17:11-15 side by side and get a better understanding of what it means to be "kept" Strongs word #5083. Daniel 12:7 puts the tribulation at 3 1/2 years, where is it said to be 7 years? Study the Day of the Lord and the resurrection of the dead, with an open mind to the placement of these events in the last days. Two cents from my side for Pre-Trib against the Post-Trib: I do not know if you have read these arguments anywhere. If you did then praise the Lord. 1) The difference between the tribulation that we now have and the tribulation that is coming on the earth is the Grace of God. The coming tribulation time would be the worst that the world ever had or will ever have. In such a case, the Grace of God should be MOST required than any other time in history but sadly but truly you will not find one word of grace, mercy, compassion, goodness or any fruit of the Holy Spirit during the coming tribulation period. 2) Why did not Paul warn the Church to be ready for the tribulation just like Jesus did explaining in detail about the persecution? 3) Why are 144k called the first fruits in Rev 14:4? If they are the firstfruits then definitely there is a harvest and that harvest is found in the latter part of the same chapter. For us, Jesus is the firstfruits (Eph 5:4) and we are the harvest. 144k are all males (because they were not defiled with women), virgins and are firstfruits. Jesus was a male, a virgin and the firstfruit. Jesus has his harvest and the 144k have their harvest. Every seed after his kind.